Harebells grow on the bank of the Snake River in east central Minnesota. 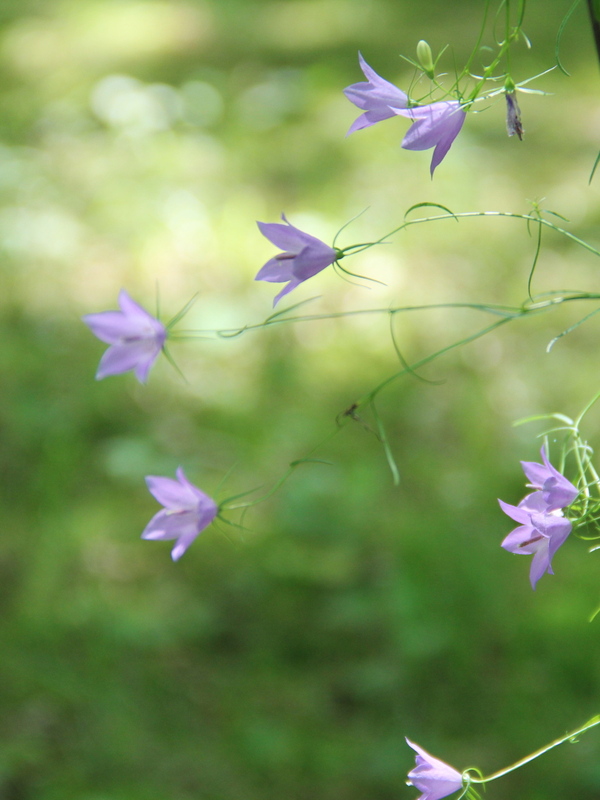 I first saw harebell flowers as a young teen hiking the north shore of Lake Superior in Minnesota. They grew out of a tiny crevice in the lichen-covered basalt slabs along the lake, and the delicate blossoms mirrored the violet-blue water on that sunny midsummer day. Next to them, in the shallow depressions in the rock, were pools of water in which tiny tadpoles swam. I was enchanted by all of it. Years later when my family built a cabin near the Snake River in Pine County, MN, I was delighted to find harebells growing on the riverbank and along the woodland edges. Harebells are also known as thimbles, bluebells, bluebells of Scotland, wind bells and heath bells. Harebells (Campanula rotundifolia) are native to the northern regions of the United States, Europe and Asia. They grow on slender upright stalks ranging in height between 6 and 20 inches. Narrow grass-like leaves cover most of the stalk; round leaves at the base of the plant often die before the flowers bloom. Milky sap in the stems is another identifying characteristic. 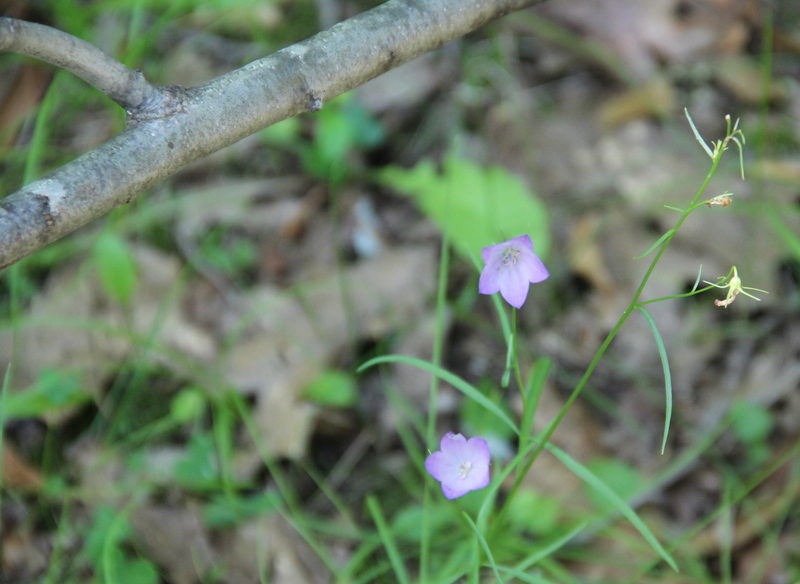 The delicate bells begin blooming in June and continue through the summer. We usually see a modest second bloom in the fall. Besides being beautiful, harebells are a source of nectar to many species of bees during the summer and I’ve noticed bumblebees frequenting them during the second bloom in autumn. Other common names for harebells include: thimbles, wind bells, heath bells, bluebells and bluebells of Scotland. Harebells blossom from June through summer, and often bloom again in autumn. 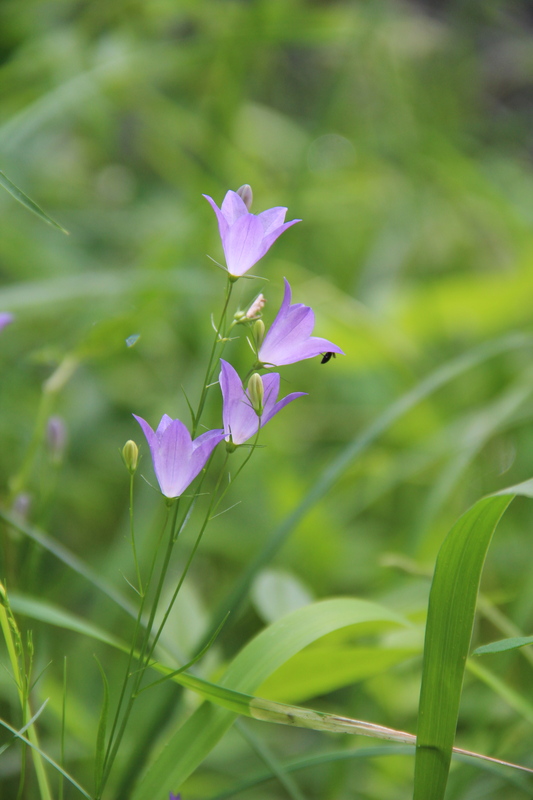 This entry was posted in Nature Photography, Pine County, Snake River, MN, Summer, Wildflowers and tagged Bluebells, Campanula rotundifolia, Harebells. Bookmark the permalink. I’ll have to start looking for them.